Because a wire grill brush generally has bristles made of stainless steel or brass, the bristles will stand up to serious scrubbing as you use it to clean your grill. As with any scrubbing tool you use for tough cleaning jobs, a wire grill brush will invariably become soiled over time. Keep your wire grill brush in superior condition by removing the greasy, grimy gunk it accumulates. Clean a grill brush to keep the bristles free of grime. Maintain the grill brush after every use by tapping it firmly against a hard surface to knock off any large chunks of grilling debris from the bristles. Use a second grilling brush to remove debris caught in the bristles. Place the two brushes together with bristles facing each other. Rub the bristles of one brush over the bristles of the other brush to dislodge debris deep within the bristles. Continue rubbing until you remove all debris. Fill a bucket half full with water from the garden hose. Add several squirts of dishwashing soap to the water, and swirl the water around to activate the bubbles. Place both grill brushes into the soapy water, and scrub the bristles against each other to wash the bristles and remove greasy residues. Continue scrubbing the bristles until you have removed all grease. Rinse the brushes well under cool water and hang them to dry. Replace the grill brush when it rusts. Stainless steel grill brushes will not rust, but brass grill brushes will rust over time. 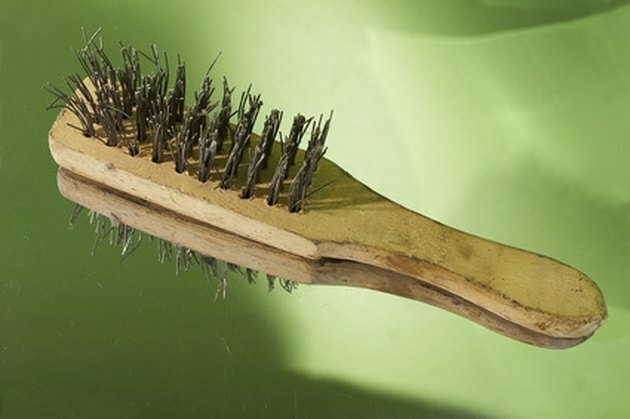 Rust will weaken the bristles, and your brush will lose its cleaning effectiveness.